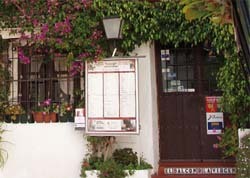 El Balcón de la Virgen is a pretty little Spanish restaurant in the city of Marbella on the south coast of Spain, which prides itself on offering the finest continental cuisine together with recipes from the Spanish region of Andalusia. If you're looking for an authentic Spanish food experience in Marbella, then look no further than El Balcón de la Virgen. Situated right in the middle of the so-called 'Golden Mile', this Spanish restaurant is in the perfect place to enjoy the Spanish sun and seaside as well as the Spanish food. The building that houses El Balcón de la Virgen is full of history. The property dates back to the somewhere between the 16th and 17th Centuries. Due to this fact, the building has a number of old features such as the walls which measure 1.5 metres in thickness and which have, unsurprisingly, remained intact up until today. Inside the restaurant there is also an old well which is 25 metres deep which has now been converted into a decorative feature rather than the only means to get water. The upper part of the building which houses El Balcón de la Virgen has an interesting facade which depicts the 'Virgen de los Dolores' (Virgin of Sorrows). This facade was originally part of chapel but now decorates the side of the building where the balcony is. This is why the restaurant is called 'El Balcón de la Virgen' (The Virgin's Balcony). As if these features did not make this Spanish restaurant sufficiently picturesque, the majority of the rest of the building is covered in the purple-flowering creeper, bougainvillea; a plant which you would find easily if you ever visit Latin America. The bougainvillea at El Balcón de la Virgen was planted there by the original owners of the restaurant back in 1986. Today this plant has become one of the most recognizable features of the restaurant and it has grown to a height of 11 metres! Inside the restaurant, there is a strong Andalusian theme running throughout. The furniture and decorations in the restaurant are made from a dark hardwood which is typical of this Spanish region. However to keep the restaurant light and airy, the walls have been painted in light welcoming colours such as white and pale oranges, completing the strong Mediterranean feel of the restaurant. The dining rooms are also decorated in a rustic feel which is amplified thanks to the antique 19th Century style lamps which are used to light the rooms. The overall effect of this decoration is a warm and welcoming restaurant that is a great place to visit when you travel to Marbella. El Balcón de la Virgen serves a variety of continental and Spanish dishes. 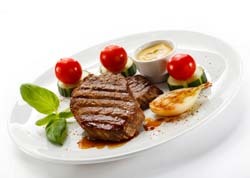 They specialise in grilled meats and always ensure that they are cooked to perfection. Fish is also one of the stars of the restaurant's menu as the fish they use comes fresh from the Andalusian coast. Furthermore, the restaurant believes that the best food can only be produced through the use of the best ingredients and so they make sure that all the produce they use is fresh and of good quality; something that has helped make this Spanish restaurant in Marbella famous. Some of the highlights from the main menu at El Balcón de la Virgen include 'Solomillo de ternera al grill con ajos El Balcón' (Grilled fillet steak with garlic, El Balcón style), 'Paletilla de cordero' (Shoulder of lamb), and 'Filete de lenguado al andaluz' (Sole fillet in Andaluz style sauce). The chef has also provided a menu of his favourite dishes which include the 'Conejo con salsa del bosque' (Rabbit with forest sauce) as well as lobster on request. 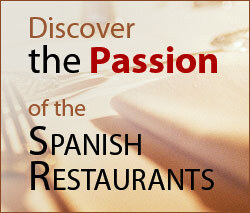 The restaurant also provides a great range of authentic Spanish paella, the country's famous rice dish. Alongside the 'à la carte' menu, El Balcón de la Virgen also offers a range of set menus which cater for all types of people including children and businessmen and women; all of which are provided in Spanish, English, French and German. For large parties, the restaurant opens up a separate room and provides an Argentinean style barbeque of chicken, suckling pig, a variety of roast meats, sausages and morcilla lamb.